New results from NASA’s Chandra X-ray observatory suggest that globular clusters, the dense bunches of stars found in all galaxies, may be less evolved than previously thought. Globular clusters typically range in age from 9 to 13 billion years, and as such, contain some of the first stars born in the galactic nursery and provide a natural laboratory to study the evolution of galaxies. Conventional wisdom states that globular clusters pass through three phases of structural development: adolescence, middle age and old age. During adolescence, the stars near the centre of the cluster collapse inward, but once interactions of double stars prevent the cluster from further collapse, it has reached middle age. Old age describes when these central binaries are disrupted or ejected, and the centre of the cluster collapses inwards. It has long been thought that most globular clusters are middle-aged with a few heading towards the end of their evolution, but the new Chandra observations suggest that this may not be the case after all. The evolution of a globular cluster. The first graphic shows the cluster forming, where single stars are shown in red and double stars in blue. The next three images represent the three main phases of evolution, corresponding to adolesence, middle age and old age (see above text for full explanation). The final graphic shows a period of extended old age, when the central ragion of the cluster expands and contracts after new double stars are formed. Image: Northwestern/W.Finney. “It’s exciting to discover something that may be new and fundamental about the way globular clusters evolve,” says John Fregeau of Northwestern University who lead the study. Fregeau studied 13 globular clusters in the Milky Way and shows that three of them have unusually large X-ray sources, which result from the interaction of stars in the crowded centres of the globular cluster, and are thought to be characteristic of middle age clusters. 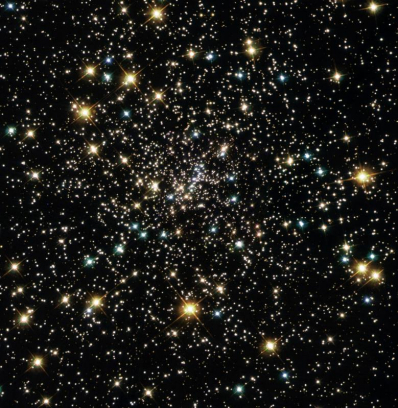 Previously, these clusters had been classified as old age because they had very tight concentrations of stars in their centres, another indication of old age, but the implication of Fregeau’s study is that most globular clusters, including the other ten that Fregeau studied, are in fact still in adolescence. "It's remarkable that these objects, which are thought to be some of the oldest in the Universe, may really be very immature in their development," says Fregeau. "This would represent a major change in thinking about the current evolutionary status of globular clusters." Hubble view of the core of one of the nearest globular clusters, NGC 6397. The stellar density is about a million times greater here than in our Sun's stellar neighbourhood. Image: NASA/Hubble Heritage Team (AURA/STScI). If confirmed, the result would help reconcile other observations with theoretical work that suggest the tightness of the central concentration of stars in the more evolved globular clusters is consistent with them being in a middle, rather than advanced stage of evolution. Other theoretical studies have suggested it can take longer than the current age of the Universe for globular clusters to reach old age. The result also has implications for understanding interactions of stars in dense environments and removes the need for exotic mechanisms such as black holes that were thought to be needed to prevent the middle aged clusters from collapsing. "Some exotic scenarios have been invoked to try to make sense of the observations and save the old theory," says Fregeau. "If this result holds up, we don't have to worry about the exotic scenarios any more."